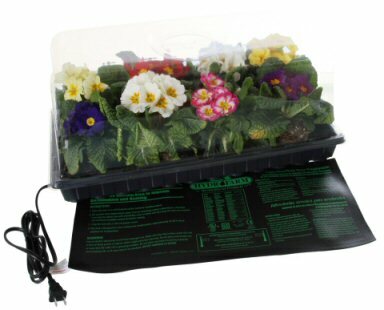 Greenhouse/Hot House Kit with heated mat 7″ helps control humidity for better rooting and growth from seedlings and cuttings from your prized plants. This dome features 2 top mounted adjustable vents and side vents to achieve fresh air flow and desired humidity levels.. When it comes to table lamps, there are a lot of makes and models out there that make perfect bedside companions. But, while they can be a great choice, this product takes one step further. Designed by French designer and architect Daniel Pouzet, the Ambienta multi-function table lamp features grow and ambient lighting. Three grow light settings (low, medium and high) are provided to accommodate different plant light requirements. The company, Sage Vertical Garden Systems, offers pre-grown rooted plants that are ready for transplanting. The hydroponic growth medium is made of natural volcanic rock, eliminating the unpleasant side effects of standing water. Adding water can be accomplished easily through the smartly designed central watering system. Whether you want to use it to grow tropical plants that deliver eye-popping blooms all year round or ferns that act as a natural humidifier, this product is something you should check out. This creation of a Canadian biologist, Jared Wolfe, really deserves a big thumb up. Being claimed to be world’s first smart microhabitat, Biopod can mimic the natural environment of a wide range of plants and animals. The fully automated system has different parts and components. LED lighting, misting with reservoir, aeration system, heating, and temp/humidity sensor are what make up the enclosed ecosystem. From lighting to watering, it can take care of various aspects of maintaining the ideal environment for what you are growing or housing. Equipped with an HD camera, the app controlled microhabitat allows you to monitor your system from anywhere. With the help of the Biopod mobile app, you can enjoy the time lapse visualization of plant growth. The data collected from your system can be shared with others via the company’s cloud-based server. If you have had limited success with growing herb or vegetable indoors, the Biopod ONE can be a great starting point. LED grow lamp, built-in timer, and water reservoir are some of the major pieces that make up the system. Click & Grow is more than meets the eye. The “real magic” does not appear on the surface. The built-in light, for instance, only requires 6 watts of energy to operate. The specially developed growth medium eliminates the needs for fertilizers or other additives. New plants that are compatible with this system are constantly released. As of this writing, selection of refills include chili pepper, mini tomato, peppermint, parsley, basil, thyme and lemon balm. A number of combo packs are also offered by the urban farming company. The Divine Tea Mix combo pack, for instance, contains peppermint, lemon balm and stevia, allowing you to enjoy flavorful tea from your own homegrown herbs without much effort. It cannot be argued that the Click & Grow System has solved different plant cultivation problems that many home gardeners face. By harnessing the effects of zero-gravity, this ultramodern creation can be a great conversation piece for you and your guests. The growing system is designed by Simon Morris, an art scientist that has brought us the FLYTE hovering lamp. Priced nearly $200, the planter may not come cheap but the maglev technology behind it is certainly interesting. The unique hovering system, that consists of a magnetised planter and an oak-finished electromagnetic base, is more than just a cool decorative element. Though the impact of magnetic fields on plant growth and development is not well-understood, some studies show that magnets help plants grow. It is also worth noting that the pot rotates 360-degree, ensuring the plant to get better sunlight exposure and air circulation. Coming with a geodesic design, the 12 sided levitating planter also produces interesting shades as it rotates. Automatic watering system is not a new thing. However, the innovations that have been made in this field are still interesting to watch. Pikaplant Tableau, the automatic houseplant watering tray from an Amsterdam design company, is one product that any indoor gardener will want to take a look at. Pikaplant Tableau is not a timer-based watering system nor a constant-feed pot. The tray does not require electricity to run, meaning it can be placed anywhere in your house. At a glance, the self-watering planter seem to involve nothing more than a transparent tank, a steel base, and three plant pots. That said, unlike many self-watering products out there, it is your plants that determine how much water they need. Designed to mimick the wet-dry cycle in nature, water is sucked up from below. A valve system that works based on humidity and pressure controls the entire process. Pikaplant Tableau is not just a set-it-and-forget-it system. It also severs as a work of art, something that you can use to brighten up any room. Aquaponics is a symbiotic system where plants use waste from live fish as fertilizer and clean the water in return. If you are interested in owning your own but not ready to build it yourself, then the Springworks Aquaponics is worth taking a closer look. It allows you easily converts a standard 10-gallon aquarium into an indoor aquaponic garden. Grow bed, tank lid, timer, water pump, high-output light are all included in the kit. This closed loop system is not ideal for root vegetables and fruiting plants like tomatoes and peppers. It works best for greens such as lettuce and arugula. Herbs like parsely should also grow nicely. Featuring vertical design, this indoor gardening system is ideal for small spaces. It can holds up to 4 pots (148 cm height). The system is designed in such a way that it does not need constant watering. The base holds about 1.5 gallons of water. An energy-efficient pump moves water through the system. It can irrigate your plants for more than 30 days. To accommodate different plant families, the self-watering vertical garden comes with a programmable irrigation timer. Another plus point about this system is that you can choose between conventional growing with soil or hydroponics. A number of plant families are available for you to choose from that include air-cleaning plants and herbs, allowing you to get the most environmental benefit from growing plants indoors. We do not need high tech gardening devices to setup an indoor garden. That said, with the help of modern technology, it will be easier for us to create suitable conditions for our plants to grow. It can lessen the maintenance and work we need to do. Bamboo pots can hold up well for many years. They are not suited to direct planting into the ground. Just like plastic containers, bamboo pots come in a range of sizes and color. This one by Rossos International resembles a durable, colorful plastic. The scalloped edging around the top adds aesthetic look to the pot. The pot will fully biodegrade within 3-6 months when placed in a landfill so natural resource will return back to your soil. CowPots is the commercial name for containers that are derived from composted cow manure. They offer an easy way to grow plants from seed. According to a study, CowPot offers faster degradation in soil compared to paper and coir containers. They last for months above ground, plenty of time to give seedlings a robust start, and will break down naturally within 4 weeks of planting. As composted manure is nutrient rich, soil conditions will get improved as the pots break down. Seed starter pots made from coconut coir is another environmentally friendly alternative to plastic pots. The fibrous material is a byproduct of coconut harvest, meaning it is entirely sustainable. Because of its antifungal properties, this renewable resource also makes an excellent substitute for peat. Plants in coir pots can also be planted straight into the ground. Just keep in mind that coconut fiber containers has lower level of decomposition compared to Cowpots. As you can see, a wide variety of containers that are truly biodegradable are available on the market. Fertilpot is one product for you who are asking for ready-to-use wood fiber pots. Composed primarily of spruce wood, the pots are intended to be planted directly in the ground. They do not require a composting situation to degrade. Depending on soil conditions, Fertilpot will be signficantly degraded in about 6-8 months. A study found that wood fiber container has a higher rate of sidewall water loss than then ones made from composted manure and coir. This translates to higher water use. Just like coconut coir, rice hull is a material that would normally be thrown away, so using it as plant containers is a great way to become more environmentally friendly. Plants grown in rice hull containers do not require more water than those grown in plastic pots. With thicker and rigid walls, rice hull containers have good dry vertical and lateral strength. EcoForms pots that are made from rice hulls and natural binding agents last up to five years outdoors. The pots are intended to be used above ground only. If you have been looking at “out of the box” uses for used pineapple waste, then have a look at these compostable flower pots. Reportedly, the pots stayed intact for an average of 45 days hence they are mostly appropriate for herbs or vegetables that have short preproduction phase. Pineapple is a powerhouse of nutrients so using pots made of pineapple waste can be a great way to naturally fertilize soil. For you who I like anything that is recyclable and sustainable, the becausewecare seedling pots are worth taking a closer look. Made from a combination of corn starch and other natural ingredients, the pots are designed to be planted in the soil with a seedling. They will start to break down in anywhere between 2-6 months. The above are just some examples of biocontainer materials. The list does not stop here. There are numerous natural and sustainable materials to make eco-friendly plant containers. You can even cheaply make your own biodegradable pots using waste materials at home. Hopefully, we can lessen our dependency on plastics.